Paper Color- Traditionally employers look for your resume to be printed on white or off white paper. If you want to go for an edge to draw attention to your resume we suggest light gray but if your main goal is to be professional stick to white. Like most rules there is an exception. Industries that are centered around being creative would possibly gravitate toward a resume printed out on paper of a different color. When applying for these types of positions research the company and make a decision on paper color based on your findings. When in doubt always choose white. Paper Weight- Printer paper is categorized by weight. The weight of paper is determined by the weight of a ream of paper before it is cut. Normally copy machines and printers are loaded with 20 lb paper. This paper moves easily through the printer due to its light and flexible nature. It is suggested that for printing resumes you choose paper that is slightly sturdier. Paper that weighs 24 lbs is said to be the perfect weight for resumes. It is not as flimsy but not as heavy as card stock. Paper Texture- If you want to pull out all the stops and make your resume super fancy then choose a paper with texture. 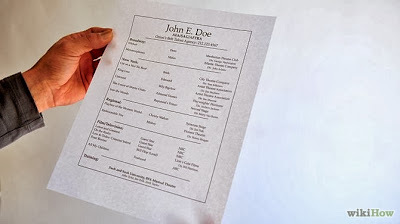 Traditional printer paper has a smooth texture to it and in most cases is more than fine for your resume. However, if you want to really wow a future employer and pull ahead in a tight race for a position then choose paper that has a linen texture. Paper of this texture is used by companies for letterhead, business cards and other professional documents. Choosing this type of texture is an indicator to a future employer that you have an understanding of how to communicate professionally. Ink Color- Do not try to get all fancy with the color of your font. Black is the easiest color to read, especially on white paper. Employers do not want to have to squint at your resume to read it. Also make sure before you print that you change the color of any hyperlinks on your resume from blue to black. An employer can not click on a hyperlink on a printed paper and do not need to be distracted by difference of color. Follow these tips for printing out your resume and you will be one step closer to employment. Do you have any questions for us about how to print our your resume? Any advice you would like to share with our readers? We would love to hear from you in the comments below! Thanks for the information. There are a lot of things to take note for a second interview, some even get professional resume writing Edmonton in order to make sure that they answer the questions right. And it's quite effective. The coaching was really helpful.